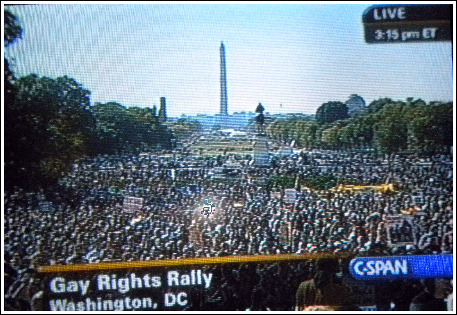 The crowds at the National Equality March in Washington, D.C. I wish I could give credit for the quote in the title for this post, but it was given by one of the speakers at the National Equality March for LGBT rights, that’s taking place today in Washington, D.C. 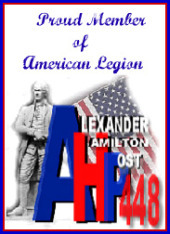 Between checking out the NFL scores, I couldn’t find anything on CNN or MSNBC that showed the event. Then with a mistaken click, there it was, right on C-Span. I think going to the march would have been a great experience, but like so many other people, the cost of time and money just seemed too prohibitive. Watching the speakers, though, on TV has been heart-stirring. When I clicked on C-Span, actress Cynthia Nixon was speaking, and she, in turn, introduced, Judy Shepard, mother of murdered Wyoming college student Matthew Shepard. A number of lesser-known local and state officials were just as inspiring, especially an openly-gay state senator from Utah. (I’ll have find out more about him later.) 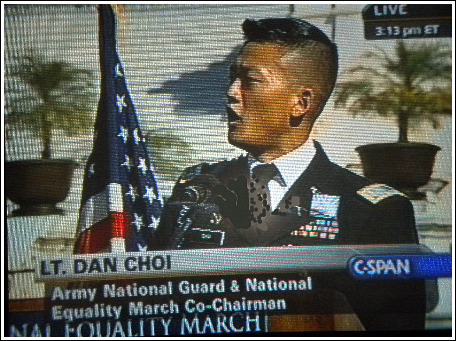 Lt. Dan Choi, the Arab linguist, who was kicked out of the Army because of DADT, and Lady Gaga, the pop diva, exemplify the range and demeanor of the speakers, but both demanding that President Obama take action on his promises. Lt. Dan Choi, Army Arab linguist, who was kicked out of the military because of "Don't Ask, Don't Tell"
Maybe watching from my comfortable sofa isn’t the same as being part of the multitudes of participants there in D.C., but still I could feel the emotion of the event. It gives me hope that change will happen. But just like what people are asking of Obama, there has to be action, not just words. 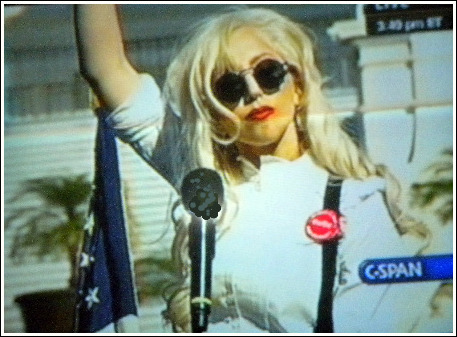 Pop singer, Lady Gaga, speaking at the National Equality March and asking President Obama to take action. I’m starting by writing to my conservative congressman. It may not be worth it; I’ve done it before, and somehow his people now think I’m a republican.